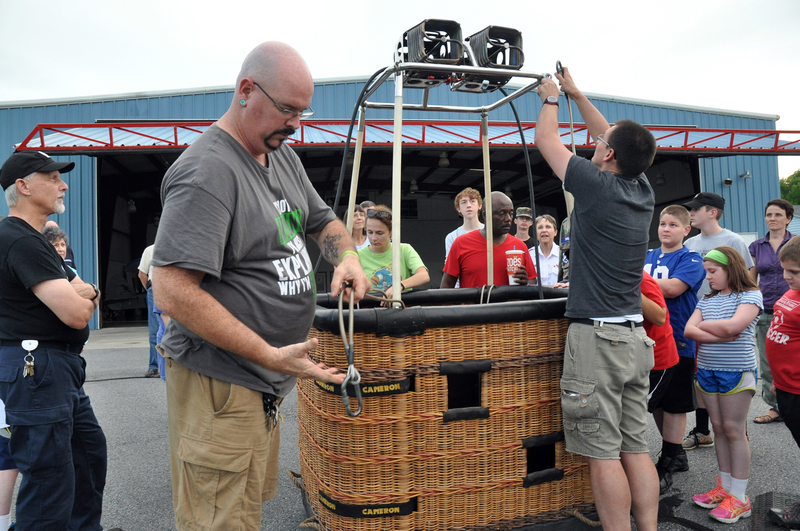 7/14/2016–MOCKSVILLE, NC–The CAP Sugar Valley Composite Squadron hosted Marsha Treacy and the Carolinas Balloon Association on July 5 as a part of our monthly speaker series. What a great group of folks! We learned so much about hot air ballooning: how it started in 1783 and has developed since that time, FAA requirements to pilot a hot air balloon, and what pilots and crew need to know before launching for an adventure in these “gentle giants.” Weather did not permit the actual inflation of the 2 balloons Marsha and crew brought with them, but the crew did demonstrate how to set up the basket and burners. They also ignited the burners so that all present could see what that looks like, and invited folks to look in the basket. Carolinas Balloon Association has volunteer opportunities for those interested in being a part of a team of chasers, who follow hot air balloons after they are launched to assist with landings. Many volunteer positions are available during the Carolina BalloonFest October 21-23 in Statesville, NC. This was an opportunity for squadron members and community to become more educated in yet another way to explore the air above us. We look forward to Marsha and Carolinas Balloon Association returning to Sugar Valley Airport for a possible launch of one of their balloons. Thank you to CBA for joining us for a most informative evening. 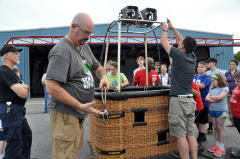 For more information about CBA, visit their website at carolinasballoonassociation.com. The Sugar Valley Composite Squadron initiated the speaker series as an opportunity to bring relevant topics to squadron meetings and involve others from the community with ideas to contribute. It is our monthly night to “invite the community” to come and participate in our activities. From aircraft to weather, with real life stories of inspiration and character building, we share the CAP core values. We have hosted CAP speakers: Lt Col Jewel Brown (WWII era CAP veteran), Lt Col Shelley Gonzales (Commander of NCLA Cadet Squadron) and Maj Joshua Cunningham (Director of Cadet Programs for the SC WING). Other prominent leaders have shared their experiences: Honda Jet executive Jon Wells, FAA Safety Inspector Bob Sutherlin, and NCDOT Aviation Safety Specialist Tom Freeman. Scott and Jennifer Shoe of Rowan County educated us about Canine Search and Rescue, and Billy Carter, SVA A&P, gave us a tour of the hangar at Sugar Valley Airport where he repairs and refurbishes airplanes. We invite other squadrons to join us the first Tuesday of the month, at 6:30 in the Blue Hangar at Sugar Valley Airport.